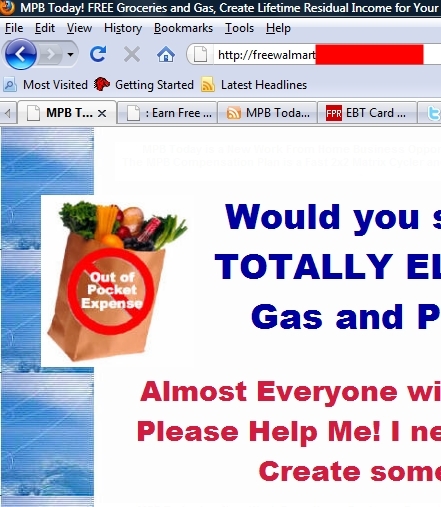 Another website that pitches the MPB Today MLM program and uses Walmart’s name in a registered domain name has surfaced. This one was registered Sept. 11, and uses an address in Fort Lauderdale, Fla. Walmart is not the registered owner of the domain, and it is unclear if the registrant has the retail giant’s permission to use its name in a domain name. Separately, check-waving videos and Blog posts using the name of a distressed Florida bank continue to appear online in promos for MPB Today. The promos show checks and the name of Gulf Coast Community Bank of Pensacola. Promos for MPB Today that show Walmart gift cards and prepaid Visa cards also continue to appear online. Gulf Coast has been operating under an FDIC consent agreement since January. The bank did not respond to requests for comment from the PP Blog last week. Neither did the FDIC. The most recent website to use Walmart’s name in its domain name positions the opportunity as a free shopping club. “Almost Everyone within the USA is saying ‘YES!” the pitch page proclaims. MPB Today operates an “Amazing ‘Recycling Matrix,'” according to the pitch page. 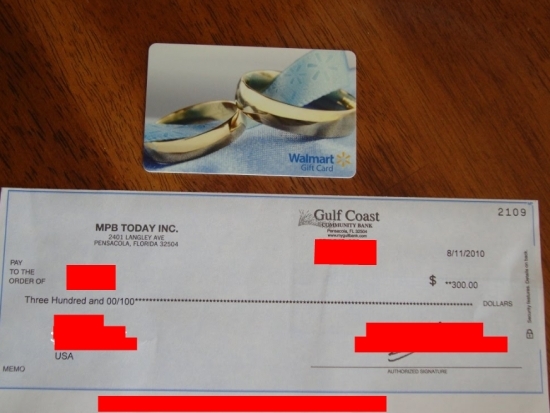 A Blog post by a separate MPB Today promoter displays both a check drawn on Gulf Coast Community Bank and a Walmart gift card. Some MPB Today affiliates have urged Food Stamp recipients, the unemployed, senior citizens, victims of the AdSurfDaily Ponzi scheme, people of faith and opponents of President Obama and Secretary of State Hillary Clinton to join the MPB today program. The U.S. Department of Agriculture (USDA) said Friday that its Food and Nutrition Service unit was investigating specific claims about the MPB Today program, which is being promoted widely online. Among the places from which the program is being promoted are forums known for pitching criminal enterprises and Ponzi schemes. In yet-another pitch for MPB Today, a promoter is shown opening an envelope mailed through the U.S. Postal Service. Inside the envelope was another envelope, which appeared to include U.S. postage. The inner envelope contained a prepaid Walmart Visa card and a Walmart gift card. Walmart has not responded to a request for comment about the MPB Today program. MPB promoters have claimed the company is “affiliated” with Walmart — and also affiliated and endorsed by the USDA’s Food Stamp program for low-income Americans. Some MPB Today affiliates have claimed in public promotions for the program that liars and thieves exist in the organization. Eight U.S. banks have failed since Sept. 10, including two in Florida. Only three bank failures occurred in the entire United States in 2007. I saw some of the cheque waving vids as well. There was one where someone had a hand held camera & walked to his post box, and opened the letter. When waving the letter etc it was all out of focus, he held the letter too close to the camera. It was very amateurish. I think it is troubling because it doesn’t make any daft claims about evilgovernment approval, it doesn’t claim other “teams” are scammers. It is worrying because this vid is very professionally produced, it is very slick. It even manages to nearly hide the pyramid structure. The other vids were the sort to appeal to the usual MLM/pyramid/ponzi idiots that frequent MMG/TalkGold/ASA Monitor. This video has the potential to bring in some real victims. That video was on the MPBtoday site originally. I believe that was produced by the company itself. Concerning Gulf Coast Community Bank. It is a small bank doing local business. It does a lot of great things for the community. Hard times-yes. Most banks have fallen upon them around here. Gary used the same bank for UPM/Trim International and is most likely his personal bank. Do they have a clue what is really going on? I’m not sure. But I would bet they don’t have a real clear view of it. My wish for them would be that they get educated real quick about what MPB is really up to.